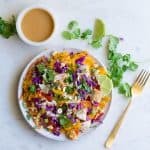 Chili with pureed pumpkin, chicken, spicy chorizo, and fresh vegetables make this a delicious fall dinner! Pumpkin makes everything taste better, even savory dishes. 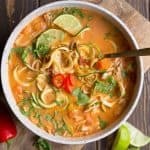 I love to use it year round, but it especially makes a welcomed appearance in many of my dinners in the fall! 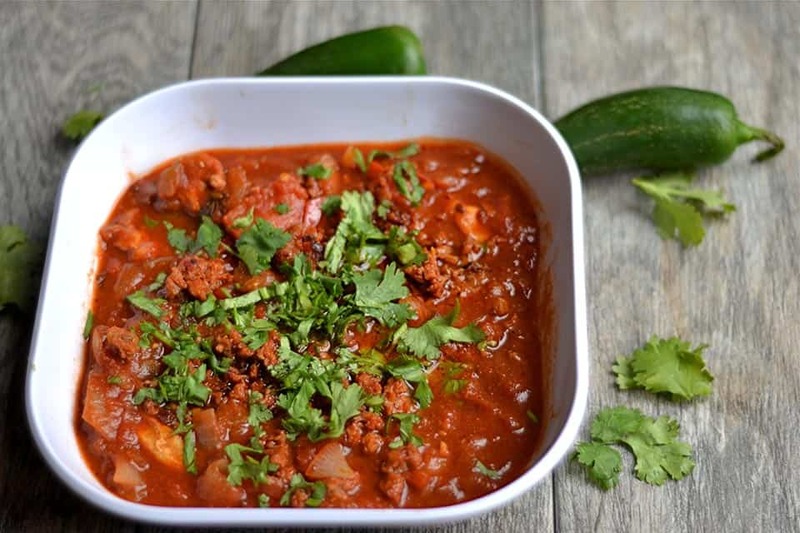 Chili is one food that I’ve loved since childhood, and I love to try just about every variation possible. Chili cook-offs are like my favorite social event, and I’m not even a football fan. Something about warm spicy food makes me so ridiculously happy. 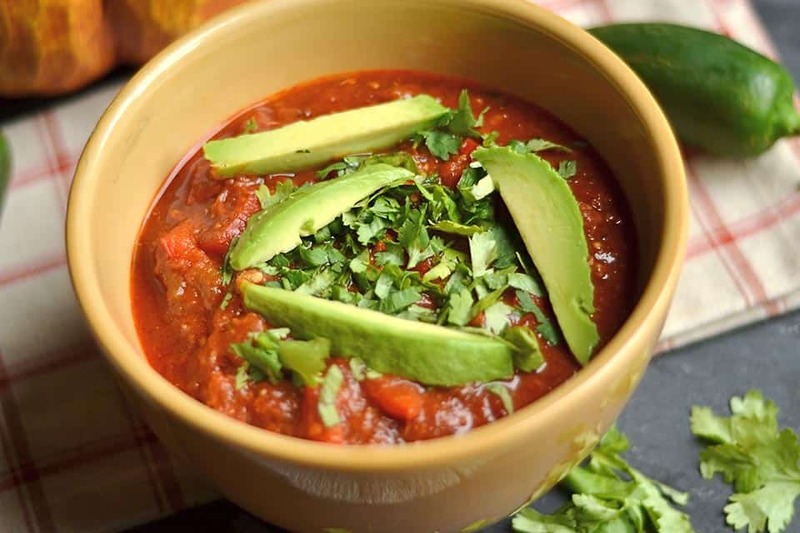 Are you headed to a chili cook-off soon? You should make this one, don’t even think twice. 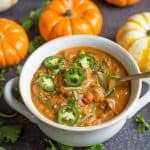 Every chili lover will be excited about the added pumpkin, the spicy chorizo, and even the chicken. It’s just perfect and guaranteed to be a winner or contender! 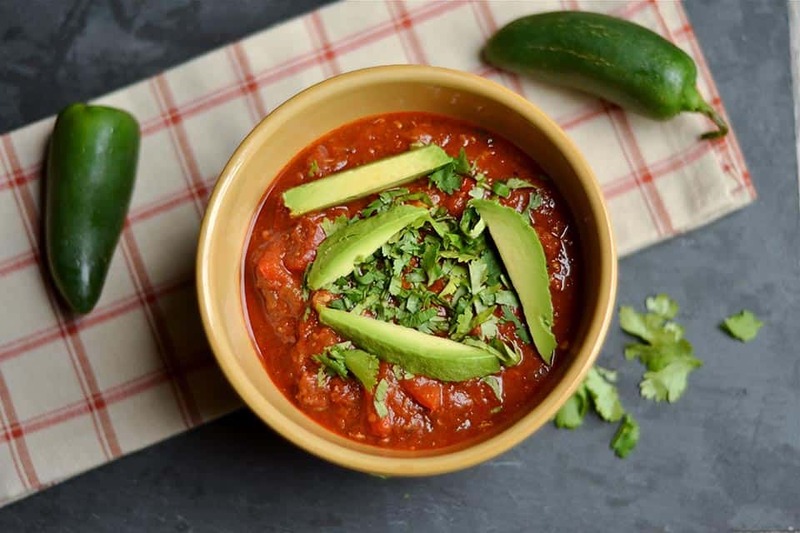 This chili is Paleo friendly, no beans here. My bean hating husband jokes all the time that “real” chili does not have beans. I have several different types of chili I make, but almost all of them are “bean-less”. If this is your forte, you’ll love my chili! If not, you can easily add beans to this. 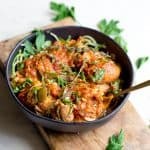 To make this recipe as easy as possible, I throw the vegetables, chicken, and chorizo together in the pot to cook. Once the meat is cooked through, add the tomatoes, pumpkin, and spices. If you do not follow a Paleo or Gluten-Free diet, I do recommend adding a 1/2 cup of beer. To me, it always makes the chili taste absolutely fantastic! 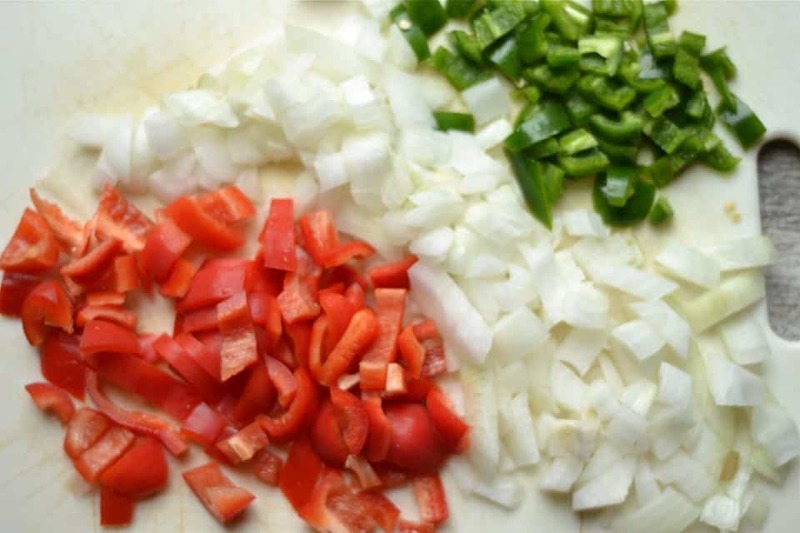 On the stovetop, heat up a large pot to medium high heat, add oil, garlic, onion, and peppers. Saute vegetables until fragrant, about 5 minutes. 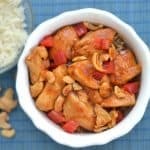 While vegetables are cooking, cut the chicken breast into small chunks, about 1 1inch. Add chicken, and chorizo, lower heat to medium. If using chorizo in casing, after a few minutes, begin to break apart the sausage. Cook meat and vegetables for another 10-12 minutes, or until meat is almost cooked through. Mix together spices in a small bowl: chili powder, cumin, paprika, oregano, coriander, and salt. Add spices to meat and vegetables. Coat the meat and vegetables evenly. Add tomatoes, and pumpkin puree. Continue to stir and mix. Lower heat to a simmer, and let cook for at least 30 minutes, up to an hour, stirring occasionally. If you do not follow a Gluten-Free or Paleo diet, I do recommend adding 1/2 cup dark ale beer. 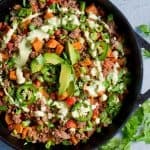 This gives the chili even more depth and taste! How do you think it would do without the chili powder? I’m not a fan of it and usually omit it from recipes and they seem to turn out fine. Hi Jessica, I think that would be fine. There are plenty of other spices in the chili. You should add in some more paprika to balance it out! Maybe 2 extra tsp. Does the recipe call for diced canned tomatoes or crushed tomatoes? I purchased diced to make this today, but wonder if crushed are needed and if it will affect the taste. Hi Kim, either one of fine!! I sometimes even use whole tomatoes. Hope you enjoy! Thanks so much for the recipe and quick response! It is simmering on my stove right now, and it is amazing!!! 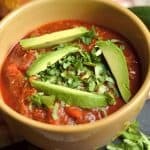 My new go to chili recipe for sure, and I love it without beans (I’m sure my kids will appreciate that too). I ended up using chicken thighs instead, and both cans of diced tomatoes. The only thing I added to it was a few tablespoons of brown sugar…..the touch of sweetness counterbalances the spice nicely (and I’m from the Cincinnati area, we like a little sweetness to our chili). 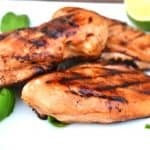 You have a new follower, can’t wait to try some more of your recipes.